. . please excuse our enthusiasm . . Miracle along the Mohawk? 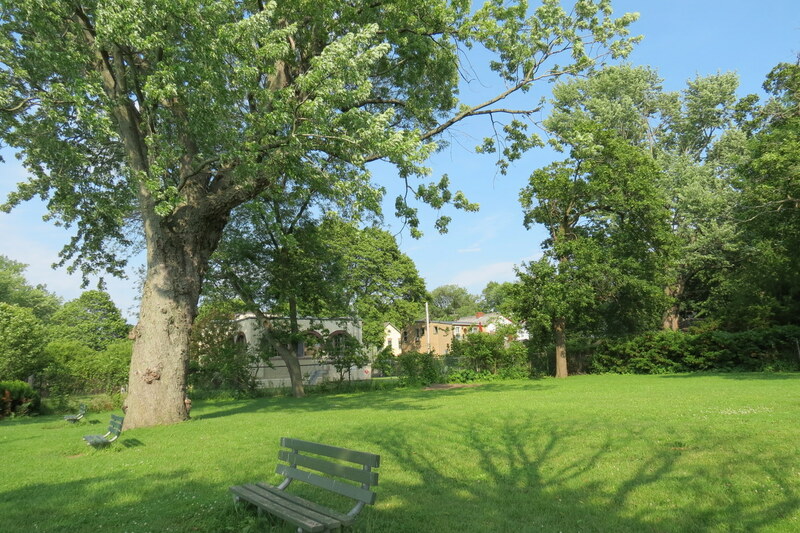 Last night, June 12, 2017, just seven weeks after suns along the Mohawk sounded the alarm about “the at-risk West Lawn of Riverside Park” (April 23, 2017), the City Council of Schenectady enacted two parkland alienation resolutions about Riverside Park. Rather than the usual rubber-stamping of mayoral proposals that happens too often at City Hall, the two-resolution “compromise” should leave less than one-seventh of the originally threatened parcel “at risk” of being removed from park use. We went from a threat to despoil a half-acre of the City’s most beautiful and tranquil parkland, to promises of best efforts to keep any alienation to no more than a 30-foot swath alongside the Old Pump House lot that would equal about 0.07% of an acre. 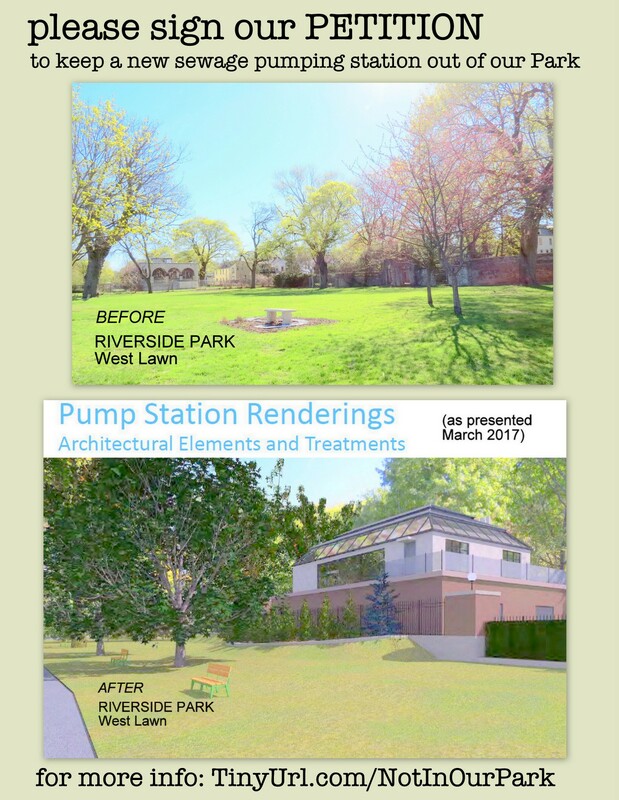 see our summary of the May 2 Stockade meeting for a litany of what was wrong with the City’s initial proposal to take up the bulk of the West Lawn with a pumping station. Note: At the bottom of this posting, we have inserted a copy of our original Pump Station Petition page, to preserve it for anthropologists and the curious. The following photos, taken today (June 13), show the piece of land lying next to the old pump station’s west fence, with an approximation indicated of the 30-foot line. 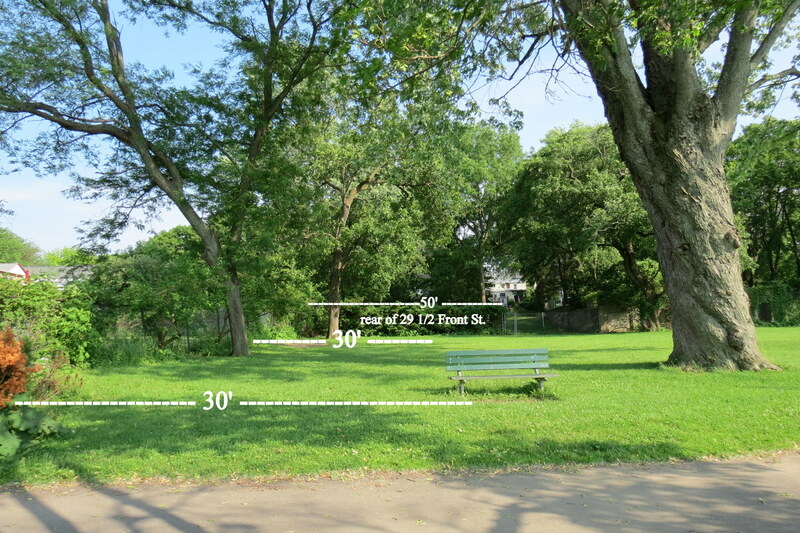 . . above: [L] the “30-ft. swath”; and [R] the “rescued” portion of Riverside Park. . When combined with the renewed vigor of the Stockade Association, the attentiveness of City Council Members and Mayor Gary McCarthy leaves me considerably more optimistic than I have been in decades, that City Hall may be willing to work with residents to produce better outcomes. (Especially, I hope, when a proposal can’t seem to pass the Smack-Your-Forehead-Test.) We did not convince a majority of the Council to refuse to alienate any part of the Park; in fact, only Vince Riggi (I) voted against requesting the home rule alienation bill (click on the image to the right for his insightful Statement). Nonetheless, several members of the Council made it clear to the Mayor and their colleagues that they were stunned by the proposal to take the precious west lawn out of park use, and that Park neighbors and users were raising some important questions. State Sen. James “Jim” Tedisco sponsored NYS Senate Bill 6692, which would grant the City of Schenectady, acting through its City Council, the home rule power to “alienate” 0.5 acres of Riverside Park for use as the location of a new sewage pumping station. As the Times Union’s Paul Nelson has explained, Sen. Tedisco wrote to the Mayor and City Council last Thursday offering to wait for a revised Bill that would alienate no more than the 30′ of land west of the current pump station fence. However, Mayor McCarthy’s principal assistant, David Fronk, wrote Friday morning that the City would not accept Tedisco’s offer. Moreover, Assemblyman Phil Steck let the City know late Friday that the Assembly was too close to the end of their session to allow a delay for rewriting the half-acre bill. 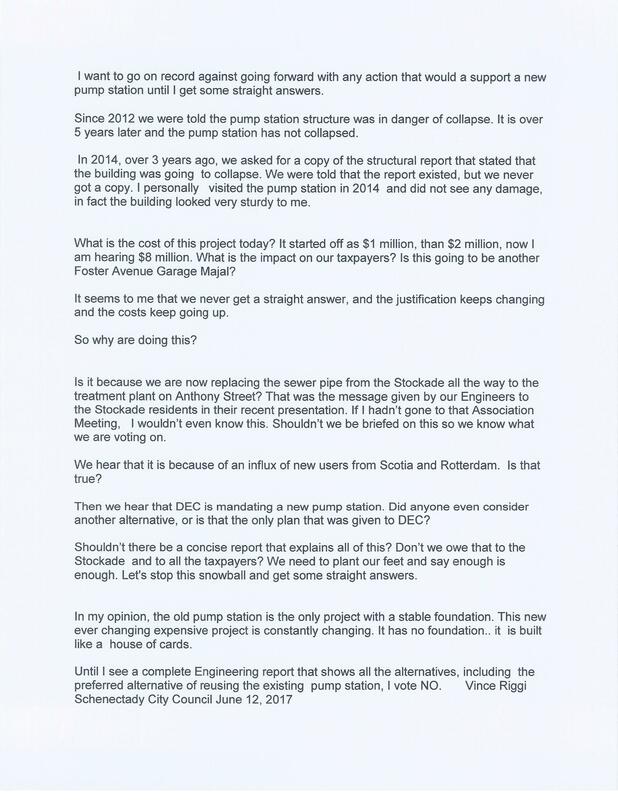 Steck and Tedisco, however, have both stressed their hope that the new pump station could be kept within the lot of the current pump station, and would use no more than the discussed additional 30 feet. For Schenectady Gazette coverage of the parkland alienation compromise, click here (if you have a subscription). Although we are encouraged, and plan to take advantage of the improved receptiveness at City Hall, please be assured that the proprietor of this website and the leadership of the Stockade Association plan to stay vigilant . 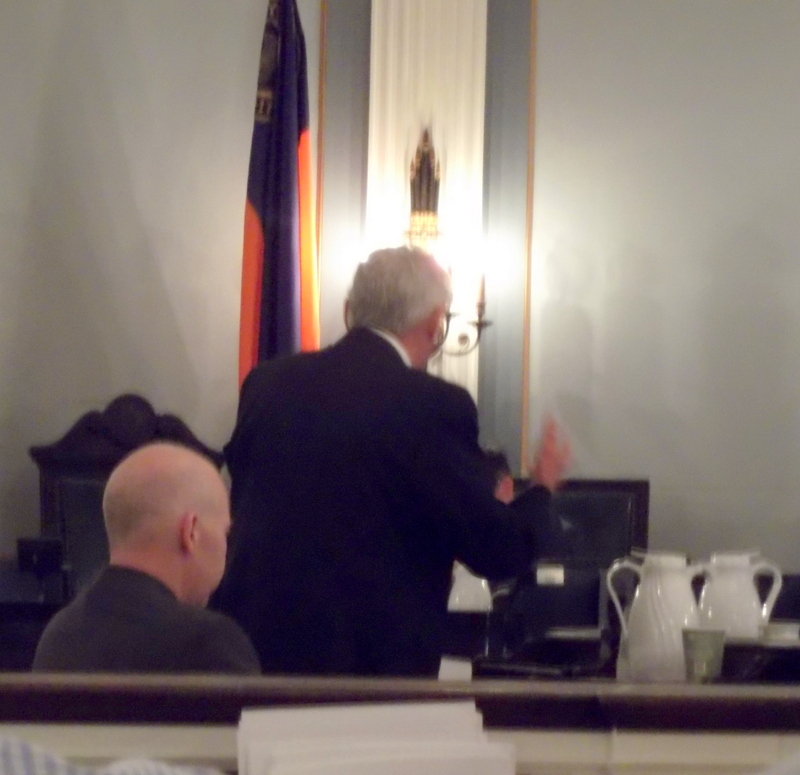 In addition, council member Riggi has promised his colleagues (photo to the right) and the Administration that he plans “to keep their feet to the fire” to make sure they keep the promises contained in clarifying Resolution. I hope we won’t have to smell shoe leather burning at City Hall. Ready to Defend Our Park! The most worrisome part of this campaign to save Riverside Park is the fact that we would need to wage such a fight for such a special part of our community. Dangerously silly proposals can only happen when the City Council is kept in the dark as to what is happening around them in City Hall, and the executive branch does not fear close questioning of its legislative requests. The Mayor and Corporation Counsel are not the only ones who should be blamed for the chronic failure to give council members (and decision-makers on other City commissions and boards) so little information explaining proposals, and especially the pros and cons of a proposal and alternatives. It is the responsibility of Council and board members to be well-informed, and to insist on the information needed to do their jobs in a responsible manner. City Hall can be a beach. I hope the near loss of the City’s precious and rare riverfront parkland stunned Council members into remembering their rights and obligations in fulfilling their duties to the residents of Schenectady, current and future. 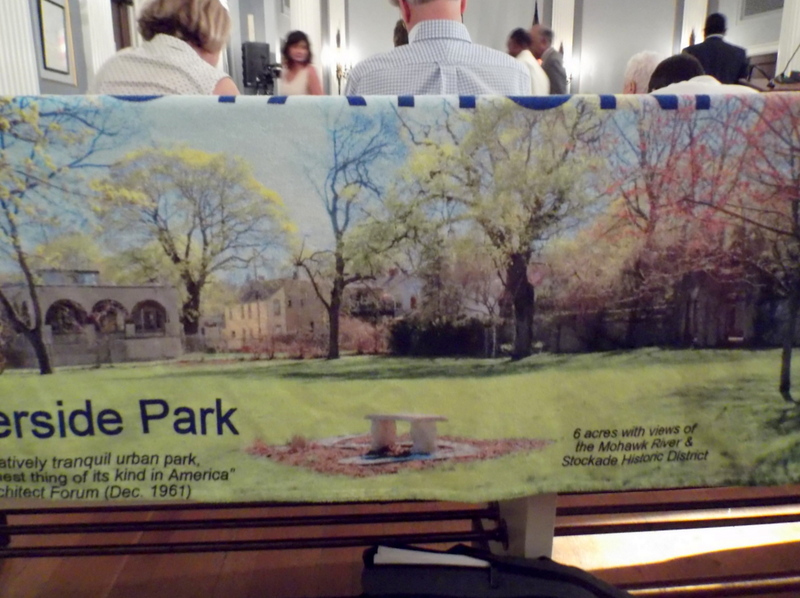 For myself, I hope yesterday was the last time I will have to bring my No Pump Station in Riverside Park beach towel to City Hall [see photo to the right]. Instead, it can accompany me to the lovely west lawn for many years to come. I’m not at all sure that the Mayor and his Corporation Counsel are particularly excited about Council members wanting fuller briefings and explanations of proposals and alternatives. One indication of their reluctance: To “make the Stockade happy”, Corporation Council accepted virtually the entire Stockade draft for the Intent to Preserve Parkland Resolution (below). Nonetheless, portions deleted from the Stockade draft tended to be those favoring more information. For example, the Second Resolve paragraph now begins, “Resolved, without a full public hearing on such design, the City Council shall . . .”. However, the Stockade version of that provision stated: “Resolved, without submission of full design criteria, including written discussion of the pros and cons of alternatives with a smaller footprint, and a full public hearing on such design and parkland alienation, City Council shall . . .”. So, continued vigilance, but with perhaps a bit more optimism, is called for. You don’t see many headlines like that these days. But that headline could have topped the story in Wednesday’s Gazette about the Schenectady City Council agreeing to reduce the impact of a new sewer pump station in the Stockade’s Riverside Park. . . Still, while it doesn’t appear to be an ironclad promise, it’s clear the council’s intentions were honorable and well-intended. Also, the language appears to leave the city with some wiggle room.. . .
. . . So opponents will still need to maintain the pressure to ensure the city keeps its pledges, including speaking out at the promised public hearing on any new design proposal. … But as compromises go, this seems as good as one might get. Opponents of the new station deserve credit for educating and pressuring city officials to minimize the impact on their park. And city officials deserve credit for listening to the concerns and coming up with a fair plan that attempts to address them. Can you imagine if Congress or the state Legislature worked this way? Finally, if the notion of parkland alienation, or the process used to achieve it in NYS, still has you scratching your head, see “Handbook on the Alienation of Municipal Parkland in New York” from the State’s Department of Parks, Recreation & Historic Preservation. The Handbook should quench, if not quash, your curiosity. A Resolution Affirming the Mayor and City Council’s Intention of Preserving Parkland in Riverside Park. 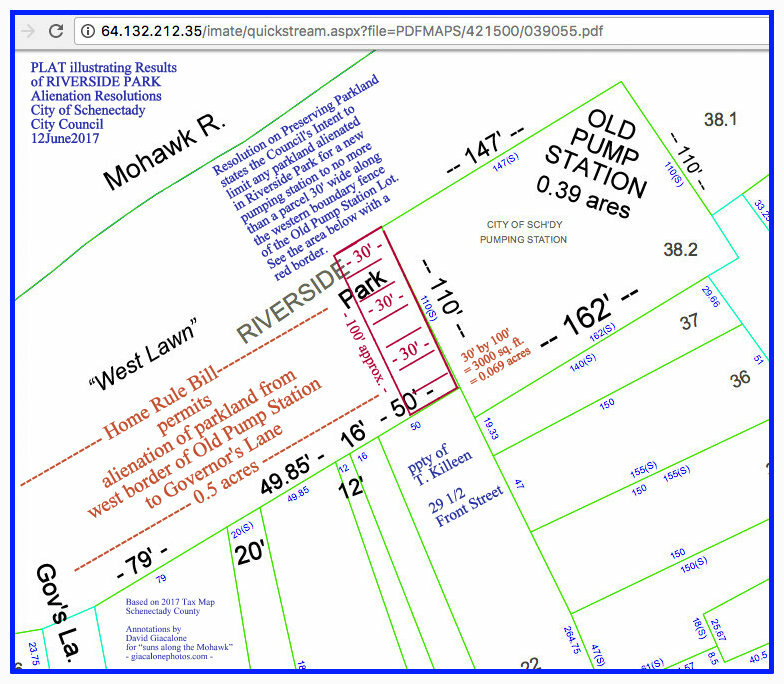 RESOLVED, any parkland included in the pending New York State legislation permitting the alienation of 0.5 acres on the west lawn of Riverside Park that is not used for the construction of a new pump station and any necessary buffer and landscaping, be deemed unalienated and re-designated as parkland with all protections currently adhering to such parkland. 12th day of June, 2017. You can help to preserve Riverside Park as we know and love it, by printing out our Stockade Association Petition, and signing it, and/or distributing it to get even more signatures. [Return instructions below.] Click the following link for a printable pdf. version of the Stockade Association’s “Save Riverside Park: No Park Land for a Sewage Pump Station” Petition. The text of the Petition can be found below. The Old Pump Station Lot is not Parkland. 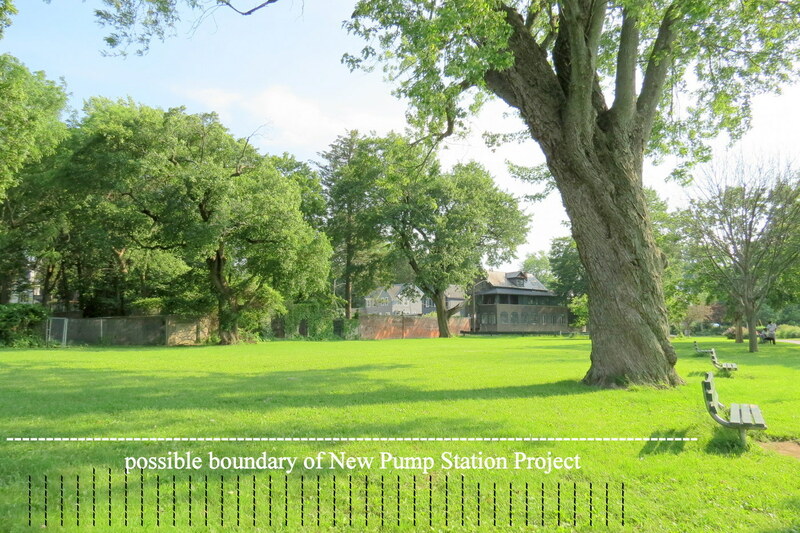 We do not consider the fenced in lot where the current pumping station is located to be part of Riverside Park and, therefore, putting a new pump station on that lot is an acceptable alternative that comes within the concept of “OUTSIDE the Park”, as it would not take any land currently being used as parkland. 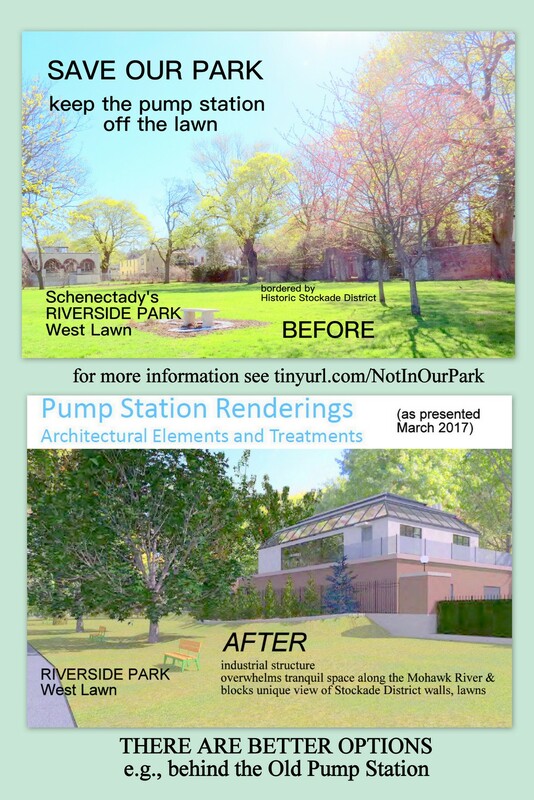 If the following poster is not sufficient reason (click on it for a larger version), please see tinyurl.com/NotInOurPark for discussion of why we oppose the proposed new pump station’s location. How to Return Petitions: You do not have to fill up the Petition sheet before returning it. When you have signed and/or have solicited other signatures, please mail the printed Petition(s) to Stockade Association President Carol DeLaMater, 20 Washington Avenue, Schenectady, NY 12305, or drop the Petition off in a container for that purpose at the front door at that address. Although having your telephone or email contact information could be helpful to us, as the campaign to save the Park continues, you need only give your name and address and signature, if you prefer not to be contacted or to share that information. We, the undersigned, call on our City, State and Federal officials to protect Riverside Park and not allow any additional park land to be used for a new sewage pump station. Riverside Park is an integral part of the Stockade Historic District and is a resource for everyone in Schenectady County and the Capital Region. The park land is irreplaceable and deserves protection. We support the City’s ongoing work to upgrade the City’s wastewater treatment system but urge our elected officials to retrofit the existing pump station or build a new pump station OUTSIDE the Park. Thank you for your help. We hope to see you at an unmolested Riverside Park soon.